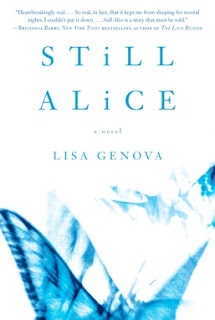 I recently read a very moving novel about a woman suffering from Alzheimer's, called Still Alice. In it, neuroscientist Lisa Genova writes about neuroscientist Alice Howland who develops early-onset Alzheimer's at age 50. I especially enjoyed the first-person account of the progression of the disease, and I'd recommend it to anyone with a loved-one or friend suffering from Alzheimer’s. I'd also recommend it to anyone treating Alzheimer's patients, as it presents Alzheimer's from an unusual perspective. Genova, Lisa. Still Alice. New York : Pocket Books, 2009. Thanks for the recommendation. I just finished reading it. Fantastic book.